Born: 15 November, 1910, in Dublin. Died: 1 June, 2005, in Brighton, aged 94. HE WAS one of the most handsome actors to appear on the stage in the pre and post-war years. Geoffrey Toone, with his commanding profile and rich lyrical voice, almost summed up a generation of actors before the era of the kitchen sink drama. It was said by one director that Toone could have stepped straight out of a portrait by Sergeant. Always dapper, smartly dressed and often smoking a pipe, he presented a clean-cut and traditional image of an English gentleman. Although he was to play in many classical productions he is best remembered playing well-bred chaps in movies such as The King and I, The Entertainer and Zero Hour. 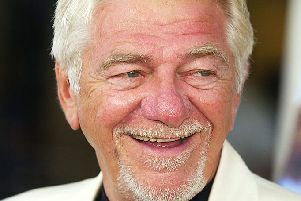 His television appearances were equally varied and ranged from several American mini series (Hitchcock Presents) to roles in Only Fools and Horses, Dr Who, Sutherland's Law and Colditz. Toone had much fun playing a pompous Lord Brittleham in Jeeves and Wooster in the early 1990s. After Charterhouse, Toone read English at Christ's College, Cambridge. But he wanted to be an actor and started with minor roles at the Old Vic in the early 1930s. Seasons at the Oxford Playhouse and Malvern Festival followed before, in 1934, Toone was cast as Fortinbras in John Gielgud's celebrated production of Hamlet. The following year he was in another historic production (playing Tybalt) in Gielgud's Romeo and Juliet with Olivier and Gielgud alternating as Romeo and Mercutio. During the war Toone served in the Royal Artillery although in 1942 he was invalided out and joined the cast of Lillian Hellman's Watch on the Rhine. Gielgud cast him again (as Leartes) in Hamlet in 1944. They rehearsed in a war-damaged National Gallery with Dame Myra Hess playing the piano at lunchtime and V1s dropping in central London. With typical sang-froid Toone said: "It was an extraordinary time. We just got on with it." After the war Toone was seen in some classic productions - notably Lady Windermere's Fan and then as Banquo opposite Michael Redgrave's Macbeth on Broadway. He spent some years in Hollywood, where he was often cast in television plays. In 1958 he returned to the UK and joined Beatrice Lillie in Auntie Mame at Drury Lane. Toone often toured with prestigious productions. He came to the Kings in a grand revival of Ivor Novello's Perchance to Dream in 1949 and returned the following year to the Royal Lyceum in a pre-West End run of The Little Hut. It enjoyed a huge success, with the young Peter Brook's inventive direction and Nancy Mitford's witty adaptation. Toone only came on in the last five minutes of the play as a savage, but the role entailed much preparation: his body had to be totally covered in make up. It was applied backstage in the Lyceum by his understudy - a young actor called Roger Moore. Toone also came to Scotland with Stuart Burge's production for the Bristol Old Vic of Henry V at the Edinburgh Festival of 1964. Two years later he was back in Bristol with the company in The Rivals, which starred Ralph Richardson and Margaret Rutherford. Toone was cast in many other West End musicals (notably Oliver! with Roy Hudd and Hans Christian Anderson), and then in 1989 he was in the stage hit Shadowlands, with Nigel Hawthorne.